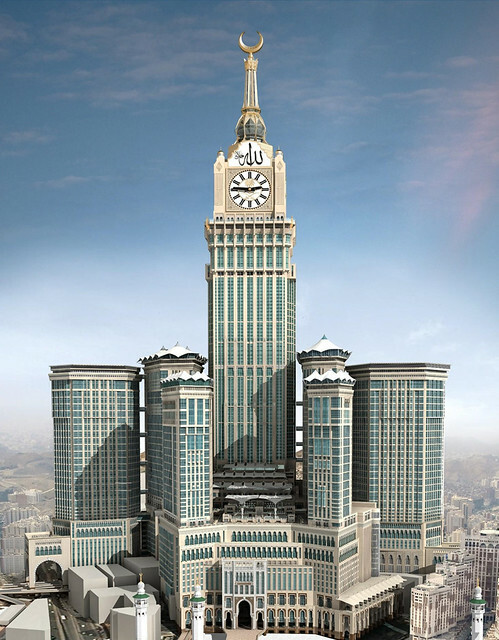 World's tallest clock tower and largest clock are part of the huge complex - Abraj Al-Bait Towers aka as Royal Clock Hotel Tower in Makkah, Saudi Arabia. 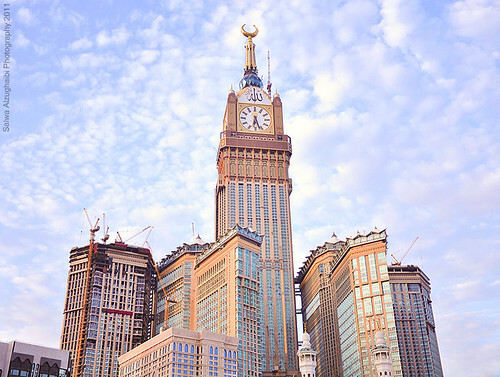 Abraj Al-Bait is World's second tallest building. 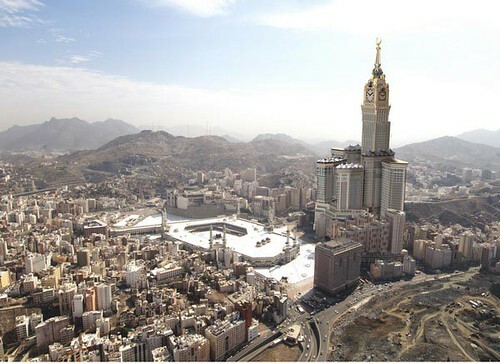 The complex is built close to the Holy Mosque, which encompasses Holy Kaaba - Islam's holiest site. Tallest Golden Minaret in the World - 71 metres (233 feet) tall golden spire topped with a 23 metres (75 feet) tall golden crescent. Constructed from 2004-2011, the 95 storied complex houses a five (unconfirmed seven) star - 2000 beds hotel, 6 residential towers, Convention centre for 1500 persons, prayer space for 10,000 persons, car park for about 800 cars, an Islamic Museum, a Lunar observation tower (to be used for sighting the new moon for deciding the start of Islamic months, especially the holy months). The star attraction of this tower, however, are its lofty clock tower and the gigantic clock face. The Clock Tower which is tallest in the World is 530 metres (1,740 feet) high. Its nearest rival Joseph Chamberlain Memorial Clock Tower in University of Birmingham, England is mere 100 metres and the clock tower of famous Big Ben is only 96.3 metres (316 feet) tall. Its Gigantic Clock which is biggest in the the World, measures 46x46 metres (151 feet) with face diameter of 43 meters (141 feet). It surpasses Istanbul's Cevahir Mall Clock (36 metres - 118 feet diameter). The minute hand of the clock is 22 metres (72 feet) long and hour hand 17 metres (56 feet). In comparison the Big Ben is only 7 metres (23 feet) diameter and its minute hand is just 4.3 metres (14 feet) long. The hugeness of the clock can be gauged by the fact that its size is almost same as width of a Soccer field. 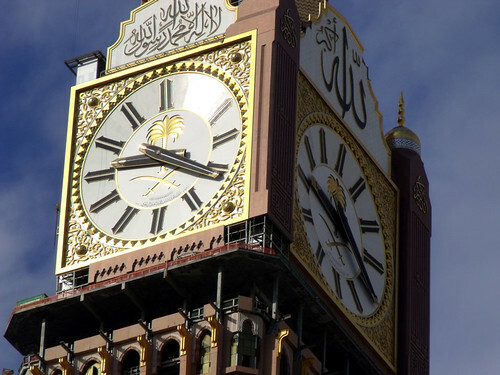 The four faces of the giant clock are made with more than 98 million pieces of glass mosaics and carry the Saudi coat of arms in the centre behind the dials. The clock is illuminated by 2 million LED lights and can be seen from a distance of 25 kilometres (16 miles). The clock tower's top has 21,000 green and white lights, which when lighted reach out to the sky and flash 5 times a day during Adhan (call for prayers). The flashing lights are meant for those who are either too far away or are hard of hearing and cannot hear the sound of Adhan. 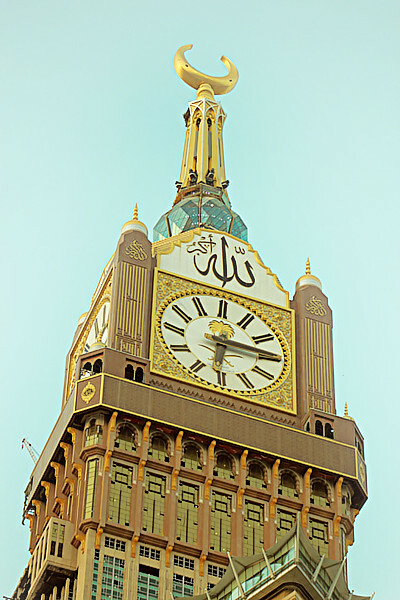 Above the clock, Allāhu Akbar (meaning: Allah is [the] Greatest) is inscribed in large Arabic calligraphy on two sides of the clock and on the two other sides, the first affirmation of faith by a Muslim - lā elaha ella Allahu, Muhammad ur-rasul Ullah (meaning: There is none worthy of worship but Allah, Muhammad [pbuh] is the messenger of Allah) is inscribed. The clock was designed and manufacture by the Swiss engineering firm Straintec and German company Premiere Composite Technologies. It started functioning from August 2010 on start of holy month of Ramadan. Total cost of the entire complex is estimated to be about 3 billion US Dollars. Image from Flickr is by ! تَرآتيلْ ~ الـ فَجر ..